If there has been an award for the political party with most number of internal problems, the United National Party will undoubtedly become the disgraceful recipient of it. The country's main Opposition aggravated its problems as the nominations for the Western and Southern Provincial Councils closed last Thursday. 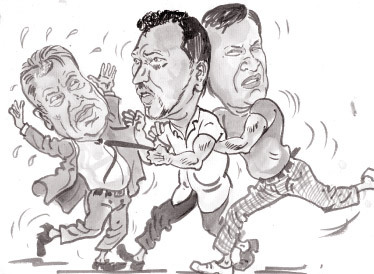 Though slight differences are common in any party when it comes to nominations for elections, the UNP seniors extended it almost to a physical confrontation. Even its leader Ranil Wickremesinghe had a close call at his parliamentary group meeting as UNP rebels made it an opportunity settle scores with the leader. Following a heated argument between Opposition and UNP leader Ranil Wickremesinghe and UNP Kalutara District MP Palitha Thevarapperuma, the stage was set for an ugly physical confrontation which was prevented at the last minute by Ranil's confidants and security men. Ranil retorted strongly when Thevarapurma faulted him for including a certain candidate in the party's Kalutara District nominations list for the Western Provincial council elections. Eye witness reports said that Theverapperuma had moved towards Ranil in a threatening manner no sooner the UNP parliamentary group meeting was over at a Committee Room in the Parliamentary complex at Sri Jayewardenepura, Kotte on Wednesday. But it was the celluloid hero One Shot who played a similar role in real life to protect his leader. Theverapperuma had been prevented from approaching Ranil by actor turned parliamentarian Ranjan Ramanayake and the Chief Opposition Whip John Amaratunga. Ranil's security officers too rushed to the scene to avoid a possible physical attack. Later, John had said that Theverapperuma was under the influence of liquor. Some reports said that the UNP MP had behaved in an unruly manner as his son's name was not included in the list. However, Kalutara District UNP MP had said that Theverapperuma's son's name was originally included in the UNP list but he had not come to sing the nomination papers. Hence, the party had put a replacement at the eleventh hour. However, Thevarapperuma rejected all those allegations and said he was only acting for the good of the party. Thevarapperuma said he did not lay even a finger on the UNP leader because he walked away when asked about the inclusion of two particular candidates in the Kalutara District list. He said Ranil moved away and avoided answering his question at the meeting. Thevarapperuma said the party had fielded an ex-employee of Foreign Employment Bureau who was charged with various frauds and another who was lending money to poor people at exorbitant interest rates. "I was keen to tell Mr. Wickremesinghe that the party won't succeed if it fielded candidates of such a calibre but he ignored me and avoided my question," he was quoted as saying. He added that the police officers in charge of the parliamentary complex would not have let him inside if he had been under the influence of liquor. "Why didn't those who accuse me of being drunk fail to make a complaint against me to the Speaker? If I had been drunk, the leader should have lodged a complaint and they would have ejected me," Thevarapperuma said. Asked about speculation that he was going to crossover to the government or join the Democratic Party led by Sarath Fonseka, Thevarapperuma said this was a story spread by UNP members who wanted him to leave the party. However, Several UNP seniors charged that Thevarapperuma had confronted the Opposition Leader in an aggressive manner, pulling Ranil from his jacket. Days after the incident, the UNP suspended the paty membership of Thevarapperuma. Sirikotha sources said that Ranjan Ramanayake, who prevented Thevarapperuma from attacking the party leader, had complained over the behaviour of the Kalutara District MP to the party's leadership council. However, Thevarapperuma has that he is yet to be informed of the party's decision to suspend his membership. The rebel said that no one from the party informed him that his membership has been suspended. However, UNP General Secretary Tissa Attanayake said the party membership of Thevarapperuma has been suspended pending a full inquiry into allegations levelled against him. Attanayake added that the letter suspending Thevarapperuma's UNP membership was sent on Friday. "The party was my first priority and I even disregarded the duties to my family because of party matters. Today I don't even have a house to live in. All this happened because the UNP was the most important thing in my life," Thevarapperuma said. He said he has already been sidelined from the party's affairs in the Kalutara district and the new decision will not make a huge difference. Referring to Chief Opposition Whip John Amaratunga's remark that he was drunk at the time of the incident, Thevarapperuma asked whether Amaratunga was the only person in the group meeting who had a nose! Though the Thevarapperuma's high drama caught media attention, it was parliamentarian Sujeewa Senasinghe who fired first at the UNP parliamentary group meeting. Senasinghe had expressed his dissatisfaction over the party's preferential treatment to favourites, ignoring his contribution to the party from the Provincial Council level. Speaking at the UNP parliamentary group meeting presided over by Opposition Leader Ranil Wickremesinghe last week, Senasinghe alleged that the party has not entrusted any responsibility to him, despite his seven-year experience as a member of the Western Provincial Council before he was elected to the Parliament. Senasinghe said he is the only UNP parliamentarian who has not been given the full responsibility of being party organiser of an electorate. The electorate he has been given is shared with another person. Senasinghe has told Ranil that the party has given preferential treatment to Ruwan Wijewardene who is a close relative of the UNP leader. He said Ruwan and him entered Parliament together at the last general election but he is seven years senior than Ruwan as he had served in the Provincial Council. "Both of us are of the same age and entered the Parliament together. Though he doesn't have qualifications, he has been given all the posts possible - leader of the UNP youth wing, working committee and leadership council membership. But I have not been included even in the UNP's Working Committee," said Senasinghe in a hard-hitting speech. He expressed dissatisfaction over the manner in which the party has treated him, ignoring his commitment and dedication to the party. "When I contested the Provincial Council elections and won, nobody helped, not even the leader. I am much senior than Ruwan but I don't have any position in the party," he said. Senasinghe alleged that UNP nominations have been given to people in his electorate without his knowledge. "Are you trying to chase even the few MPs left?" he questioned from the UNP leader. UNP to lose Colombo Mayor? UNP's decision not to give nominations to Feroza Muzammil, wife of the Mayor of Colombo A.J.M. Muzammil, will add more problems to the main Opposition. Unconfirmed reports said that a dejected Colombo Mayor may switch allegiance in the near future. Reports said that the Mayor of Colombo was dejected after UNP nomination board's decision to reject his wife Feroza Muzammil to contest from Colombo District on the UNP ticket. In less than 24 hours after her rejection, Feroza Muzammil resigned from the National Executive Committee of the UNP. The Colombo's Mayor has extended his fullest support to the city development drive initiated by the Secretary to the Ministry of Defence and Urban Development Gotabaya Rajapaksa. As a result, the mayor's opponents have conspired against Muzzamil. The UNP experienced another resignation in disgust last week when Colombo District MP and party stalwart Ravi Kaunanayake resigned from the party's nominations board over serious differences. Ravi had resigned due to some unilateral decisions taken by the party leadership and also bringing irrelevant candidates from outside Colombo to contest the provincial council election. In the wake of the conflict paired with the lack of support by other party members, Ravi tendered his resignation to quit the Nominations Board. Despite his decision to resign from the nomination board of the party, Ravi had said that he will actively take part in the party's election campaign for the Colombo district. He said certain decisions made by the nomination board will make a negative impact on the final result of the Colombo District. "We have lost the chance to field a 'fantastic team' for Colombo. Now we only have a 'team'. We also added that some unwanted elements are now on the UNP list and the party's nomination board has to deal with the ramifications of its decisions," he said. Ravi said he had a discussion with the UNP leader after sending the letter of resignation. But the Kotte UNP heavyweight said that he does not like to disclose on matters that were discussed with the party leadership. Ravi stressed that he has not fallen out with the party leadership and would continue to support Ranil. Many UNP supporters thought that the party leadership would forget the differences and unite at the forthcoming Provincial Council elections by giving nominations to former council members Maithri Gunaratne and Shiral Laktillake. But Ranil was adamant that they should not be given a chance to contest on the UNP ticket. As a result, Maithri and Shiral will not be able to retain their seats in the Southern and Western Provincial Councils. However, Maithri said he and Shiral Laktilleke would resume the struggle from Kandy to remove UNP leader and abolish the controversial leadership council in April after the UNP's anticipated defeat at the forthcoming Provincial Council elections. He said they would elect Sajith Premadasa as the party leader as the first step of UNP to power. "Our party memberships, posts of organiser and councillorships were taken away and now we have been deprived of our nominations as well. But we will not stop our struggle and will protect the UNP and its members even at the cost of our lives. Ranil has shown that he is the one who takes the decisions and not the leadership council. The leadership council has become a joke," he said. Maithri predicted that the UNP would not get at least 30% of votes at the upcoming Provincial Council Elections. "We will organise another protest march in April from Kandy urging the UNP leadership and the leadership council to step down," he said. Former Western Provincial Councillor Shiral Lakthilaka said that even though they were not given nominations they would remain in the UNP without forming another party and would continue their struggle to change the party leadership. "The UNP leadership council chairman Karu Jayasuriya was unable to do anything regarding the finalising of the nominations. That alone proves that the leadership council does not have any power. If someone tries to expel us from the party, it would be a complete failure," he said. At the auspicious time the new Dolos Mahe Pahana and Gantara Kuluna (belfry) installed at the Sri Pada Maluwa were commissioned amidst the chanting of Seth Pirith by the Maha Sangha on Friday, President Mahinda Rajapaksa participated paying homage by sprinkling jasmines from aboard a helicopter hovering over the site. The Maha Sangha led by the Most Ven. Udugama Sri Buddharakkhita Mahanayake Thera of the Asgiriya Chapter who arrived at the Sri Pada Maluwa ceremonially commissioned the Dolos Mahe Pahana and Gantara Kuluna by chanting Seth Pirith in the presence of Defence and Urban Development Ministry Secretary Gotabaya Rajapaksa. Proprietor Kandy City Center Thusitha Wijesena sponsored the Pinkama on the guidance and instruction of Sri Pada Istanadhipati Ven. Bengamuwe Sri Dhammadinna Nayaka Thera. The 8,613kg Dolos Mahe Pahana and 9,000kg Gantara Kuluna made of stone were airlifted in parts to the Sri Pada Summit by an Air Force helicopter for the first time in an exercise which took nearly a week to complete. Sabaragamuwa Chief Minister Maheepala Herath, Army Commander Lt. Gen. Daya Ratnayake, Government Agent for Nuwara Eliya D.P.G. Kumarasiri and Government Agent for Kandy Gamini Seneviratne were also present on the occasion. Hirunika Premachandra, who is contesting next month's elections to the Western Provincial Council under the UPFA ticket, is a symbol of modern thinking, SLFP General Secretary Maithripala Sirisena said last week. The minister while making these remarks at the launch of her political campaign said the SLFP had taken a bold step by introducing a new set of politicians with a vision in line with modern times. He said it would be candidates like Hirunika who would triumph at next month's elections. The minister recalled her father's tragic death and said it posed many problems for the UPFA and the SLFP. Hirunika, who then addressed her supporters and well-wishers, said she was expecting many obstacles and criticisms from her political rivals during the election campaign. "I am sure my late father will guide me from wherever he is now and will be with me as I walk this difficult path," she said with her eyes brimming with tears. Indicating that her ambitions went beyond the provincial council, Hirunika said she would continue to remain Lucky Aiya's daughter no matter what position she held in politics. She urged her supports to stick with her throughout her political career. Some of the powerful nations such as China and Russia have pledged support for Sri Lanka against international conspires as the US-lead Resolution against Sri Lanka is to brought up at the UNHRC in Geneva next month. With the US indicating that it would move a resolution on Sri Lanka over alleged human rights abuses during the last stages of the war, Sri Lanka will bank on Chinese support to neutralize the resolution. External Affairs Minister G.L. Peiris will make a four-day visit to China from tomorrow as a special envoy of President Rajapaksa to garner the much needed Chinese support. During the three-day visit on the invitation of Chinese Foreign Minister Wang Yee, the minister will meet Chinese Deputy President Li Yuanchao, Foreign Minister Wang Yi and Li Baodong the Deputy Foreign Minister in charge of UN and HR Affairs. External Affairs Ministry sources said the US sponsored resolution that is likely to be presented at the March UNHRC sessions will be a main feature at the discussions and Sri Lanka would expect Chinese support to face the resolution. China became a member of the UNHRC once again from this year. At the previous sessions when the US sponsored resolution on Sri Lanka was submitted, China had actively campaigned among member states with Chinese influence to defeat the motion. Chinese Ambassador to Sri Lanka Wu Jianghao said recently that China will 'unswervingly' speak for Sri Lanka at the UNHRC sessions. The Ambassador said China recognised the progress achieved by the Sri Lankan Government and its people in economic and social development after the 'internal conflict' ended. Reiterating that China and Sri Lanka are true friends, he said a friend in need is a friend indeed. "We believe that Sri Lanka should be given more time and space to solve its problems by itself. In the days to come, we will continue to unswervingly speak for Sri Lanka at the UNHRC to uphold justice," he said.